Over on YouTube user pascal poulain has uploaded a short video that shows a timelapse of the flight path of a weather balloon in Cesiumjs as it rises and falls, as well as a time lapse of a marine tanker docking, with the signals received with an RTL-SDR. In a third video pascal also shows a visualization of glider flights tracked via FLARM and the Open Glider Network which also obtains most of it’s data through RTL-SDR contributors. Cesiumjs is a tool similar to Google Earth. The main difference is that it works on a wider array of devices through a web browser without the need for any plugins. It is often used for visualizing data on the globe. An example of some of its many demos can be found here. We’re not sure what tools pascal used, but over on GitHub there is a tool called airtrack which can be used together with dump1090 to display flights in real time on Cesiumjs. Illustration of 3D realtime tracking of weather sonde. 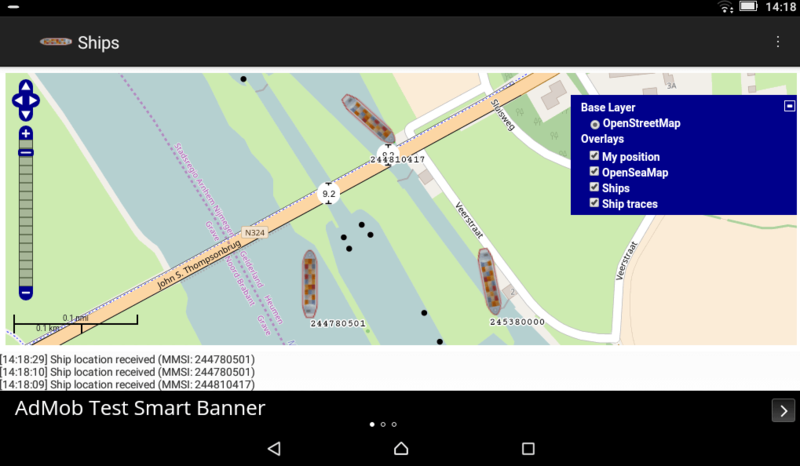 Today an Android app programmer sent a message to let us know about his new open source RTL-SDR compatible AIS app called Ships. This is a free app that allows you to decode AIS signals, and plot them directly onto an OpenStreetMap/OpenSeaMap or output the data via UDP to another mapping program. Ships also has another interesting feature which is that it will automatically determine the PPM offset of a dongle, meaning that generic dongles without TCXO’s can be easily used for AIS. It appears to do this by using the AIS signals themselves, so you will need sufficient AIS traffic in your area for the calibration to work. 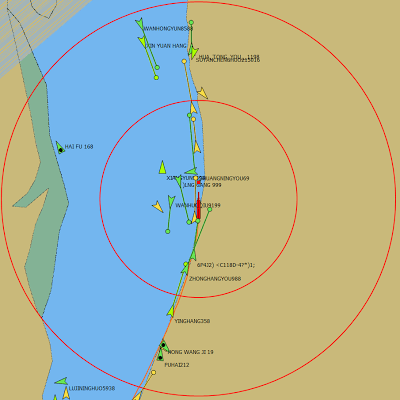 AIS stands for Automatic Identification System, and is a system used to track the locations of marine vessels. It is similar to ADS-B in that nearby ships can be plotted and tracked on a map by using an RTL-SDR as the receiver. We have a tutorial for PC available here. The app can be downloaded for free on Google Play, and the open source code is available on GitHub. The MATLAB Central post includes MATLAB source code for the AIS decoder, captured data files from Boston and San Francisco, an app for easy configuration and operation of the decoder, and instructions for installing the RTL-SDR Hardware Support Package and AIS Decoder app. If you want to learn how AIS works, and how to write a decoder, then a MATLAB example like this is an excellent resource. Recently SV3EXP wrote in to let us know that he has been documenting his experiences with trying to get aisdecoder to decode both AIS channels simultaneously. AIS stands for Automatic Identification System, and is a system used to track the locations of marine vessels. 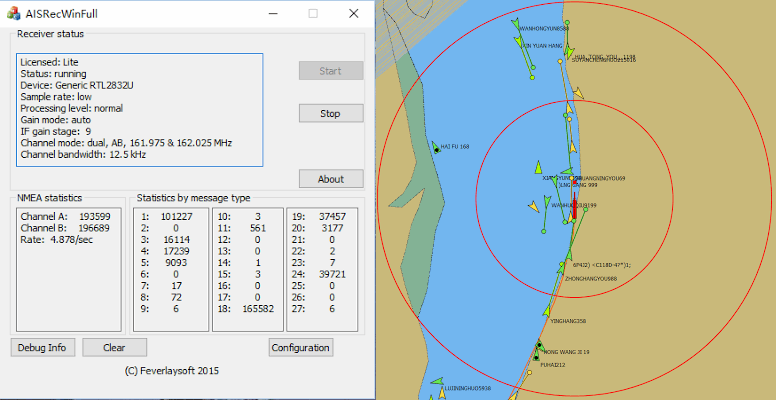 With an RTL-SDR or other SDR radio, and appropriate decoder software you can plot ship positions on a map. As the AIS system uses two separate channels for redundancy, you can get a faster and more reliable update rate if you monitor and decode both channels. On his blog SV3EXP shows how he uses Linux and the “demod” and “csdr” tools to demodulate multiple channels at the same time from IQ data generated by rtl_fm. The demodulated data is then fed to the aisdecoder software for decoding, and then fed to aisdispatcher for feeding the AISHub.net AIS data aggregation website. Of course the easier solution to decode both AIS channels at once is to use decoding software that already supports this, such as AISdeco2 or AISrec which can be downloaded at http://xdeco.org, and https://sites.google.com/site/feverlaysoft respectively. But regardless SV3EXP’s method does show an interesting way to demodulate multiple streams using only command line tools. SV3EXP also wanted to point out that he is selling a bias tee powered PSA4-5043+ based LNA on eBay which is compatible with the bias tee on our RTL-SDR Blog SDR units. Over on YouTube user Tobias Härling has uploaded a video showing how he used a Raspberry Pi and RTL-SDR dongle to set up an AIS receiver. AIS stands for Automatic Identification System and is a radio system similar to ADS-B which allows you to create a radar-like system for boats. For Windows we have a tutorial on AIS reception here. In his setup he uses rtl_ais and the kplex software and shows how to install everything from scratch. He also shows how to set the system up so that decoding automatically starts up and begins outputing NMEA data through the network when the Raspberry Pi is powered on. This way an a device like an iPad could be used to run OpenCPN to view the plotted ships. AISRec is an RTL-SDR (and now Airspy) compatible AIS (automatic identification system) dual channel decoder. AIS is an acronym for Automatic Identification System and is a system used by ships to broadcast position and vessel information. By monitoring AIS transmissions with the RTL-SDR we can build a boat radar system. Added auto detection of devices when devices are plugged in. Added the support for airspy. Allow selection of devices by serial number for rtlsdr dongles. Added AISRec core 3.0. The new core is 2x faster than AISRec core 2.0. Added one embedded multi-user TCP server. Any client works with AISRec should implement auto reconnection. Added auto display of local IP for the TCP server. Added one output to one serial port. Added interactive changes of gain parameters for devices. A few changes on GUI. Added an icon for GUI. Users should reset the windows icon buffer to allow the display of the new icon. In addition, while AISRec hopes to be commercial software one day, at the moment they are currently offering free registration. See their FAQ for information on registering for free. 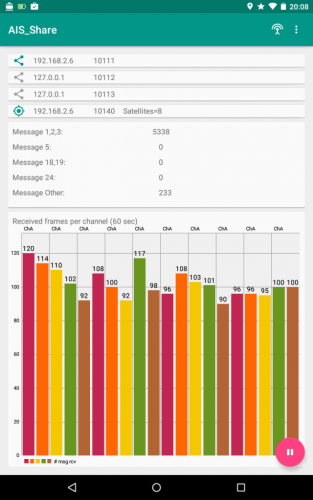 AIS Share is an app for Android that allows you to turn an Android device into an AIS receiver by using an RTL-SDR. AIS stands for Automatic Identification System and is used by ships to broadcast their GPS locations, to help avoid collisions and aid with rescues. An RTL-SDR with the right software can be used to receive and decode these signals, and plot ship positions on a map. 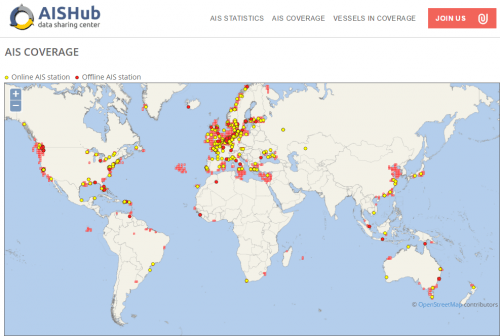 AIS Share is a dual channel decoder that outputs decoded NMEA messages via UDP, so that plotting software like OpenCPN can be used to display the ships on a map. AIS Share had been around before in another form known as rtl_ais_android which we posted before, but this version of AIS Share is a newly updated and improved version that now includes a very nice GUI. The app costs about $2 and is available on the Google Play store, but there is a demo available that will work up until 1000 messages are received. You will need an RTL-SDR and a USB OTG cable to run the app. 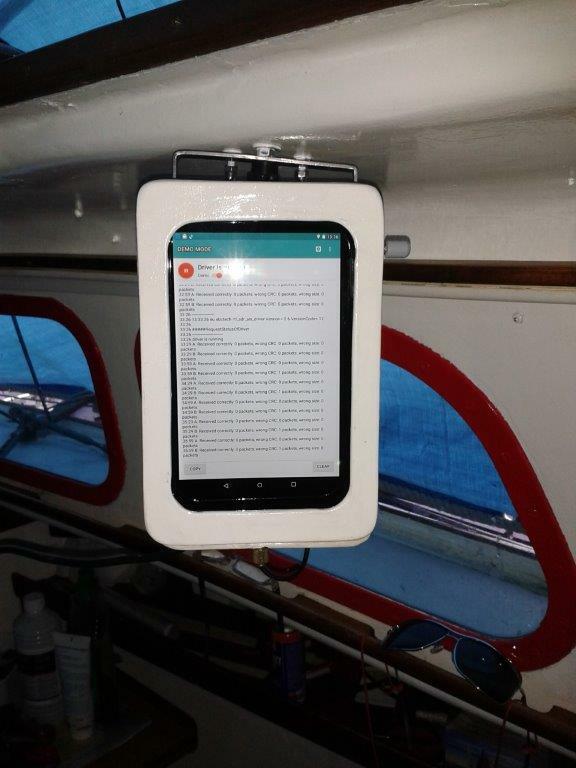 Recently the author of the app received word from a user called Harmen who has successfully been using his AIS Share app on his sailboat. Harmen uses the app on an Android tablet which is enclosed in a waterproof box. For an antenna he uses a coax collinear. In the future the author writes that he’d like to update the app to support things like the ability to change more dongle settings like bandwidth/sample rate and add the possibility of using the internal phone/tablet GPS. He is also open to any community suggestions. AIS Share Receiver on the sailboat in a waterproof case. The back of the Android Tablet, showing the RTL-SDR and the antenna connection. The AIS Share main screen GUI. Back in 2015 we posted about the free trial version of AISRec a few times, but we never really saw a full completed version get released. So far this year the full version is still not released, but the programmer Jane Feverlay has created a website and uploaded the latest Windows version of their trial version software. 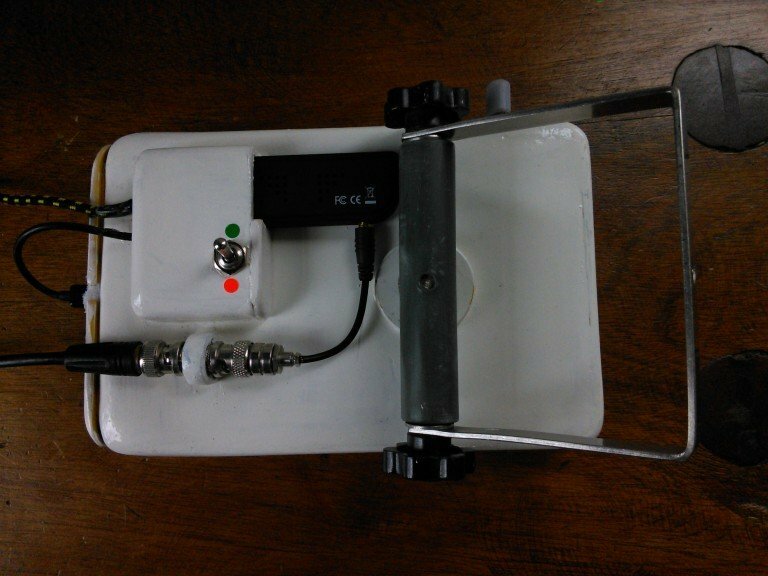 AISRec is an RTL-SDR compatible AIS decoder that is made for Windows and Android. AIS is an acronym for Automatic Identification System and is a system used by ships to broadcast position and vessel information. By monitoring AIS transmissions with the RTL-SDR we can build a boat radar system. We have a tutorial on this here (using other software). 1. Work with all rtlsdr dongles. Allow future support for other SDR devices. 2. 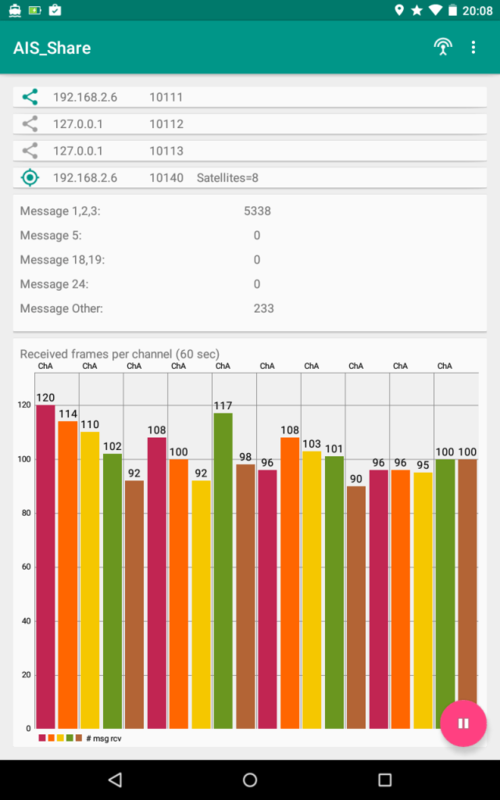 Stable reception of AIS signals at as low as SNR 7 dB. 3. Tolerance to frequency drifts > 30 ppm. 4. Dual-channel reception at 161.975 MHz and 162.025 MHz. 5. Channel selectivity > 56 dB. 6. Low CPU usage. No problem for Atom CPU and above. 7. Output all types of AIS messages (including Class A and Class B) in NMEA formats to UDP ports. 8. Convertion of AIVDM to AIVDO messages for your own ship. 9. Display of the received NMEA messages and the statistics. The author of AISRec writes in an email to us an explains that the trial version has a time limit and an RX message count limit for each run, whereas the registered lite version will not. The pro version will have some additional features. Currently the author has no method for taking in paid registrations, but plans to have this ready in the future. We will post again once registration is available.